Good day, my fellow book lovers. 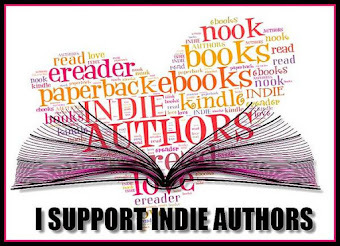 As I've said before, and will probably say again and again, I'm always excited to host visits from authors, fellow bloggers, and other book people. 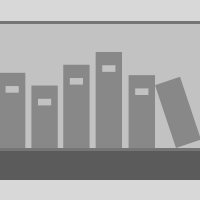 Today's bookish person is another character, and she's stepping off the pages from the Kebab Kitchen Mystery series, including the latest One Feta in the Grave by Tina Kashian, Lucy Berberian. Lucy is the manager of the Kebab Kitchen restaurant and the featured amateur sleuth in this series. This morning, Ms. Berberian will be introducing herself to us via a little Q&A. 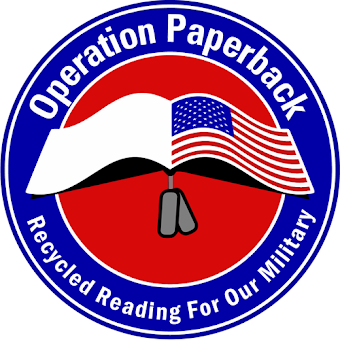 Thank you, Ms. Berberian, for stopping by and I'll turn the blog over to you. 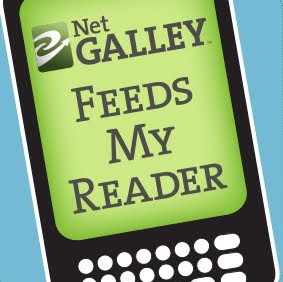 First, I'd like to thank The Book Diva's Reads for inviting me as a guest today to celebrate the release of One Feta in the Grave. I'm happy to be here! I'm the manager of my family's Mediterranean restaurant, Kebab Kitchen, at the Jersey Shore. How did you come to be a restaurant manager? I didn't plan to be a restaurant manager. I'm a refugee of a Philadelphia law firm. I returned home only to find myself sucked back into my family's Mediterranean restaurant. But after realizing the business isn't so bad and my true friends are in Ocean Crest, I stepped up and decided to manage the restaurant so my parents could ease into retirement. It's been challenging work, but I love it. Tell us about your Jersey Shore town. Ocean Crest is a small town that triples in population during the summer season. It's quaint and has a mile-long boardwalk that brags a pier with an old-fashioned wooden roller coaster and Ferris wheel. It's a perfect place to vacation with your family—minus any murders. Tell us more about that famous boardwalk. The Jersey Shore boardwalk is iconic! The first boardwalk was created by Andrew Boardman in 1870 in Atlantic City, NJ. Over the years, the boardwalk spread to the neighboring Jersey Shore beach towns. These sprawling boardwalks with dozens of eateries, shops, and amusement piers have become famous. I jog the Ocean Crest boardwalk three times a week. Working with food all day makes exercise a necessity. It's an eclectic mix of shops and eateries. I love the frozen custard, perusing the T-shirt and novelty shops, and riding the Ferris wheel. Also, my encounters with boardwalk shop owners, tattoo parlors, and a psychic medium all make for interesting witnesses and suspects. Amateur! The word sleuth makes me nervous. I didn't set out to solve crime, but I have an inquisitive mind. Other's say I'm nosy. I blame it on my law school education. Katie Watson has been my best friend since grade school. She is also married to an Ocean Crest beat cop and I've been living in their guest bedroom in their cozy rancher since returning home. She's also my sleuthing partner and we investigate crimes together. I also have to mention Kebab Kitchen's business neighbor. Michael Citteroni runs the bicycle rental shop next door, and he is one of my close confidants. Even though he could grace the cover of a men's fashion magazine, I feel a kinship with him. Just like me, he has an overbearing ethnic father. Michael owns a Harley-Davidson, and against better judgment, I rode with him for the first time a month ago. Turns out, I loved it and we have gone on more than one ride to the boardwalk. Michael and Azad don't see eye-to-eye, but they have managed to co-exist as business neighbors. Are there any four-legged animals in your life? Yes! My family has adopted an outdoor restaurant cat named Gadoo, which means cat in Armenian. Not very original, I know. Gadoo is orange and black and feisty, and I always stock his favorite treats from the local grocery store. Who are the other people in your life? My parents, Angela and Raffi Berberian, play an important role in my life. We are a tight-knit Armenian, Lebanese and Greek family. That also means that everyone is in everyone else's business. My matchmaking mama has been driving me nuts. Kebab Kitchen's waitresses are my older sister, Emma, and a long-time restaurant employee, Sally. Then there's Investigator Calvin Clemmons. We haven't always gotten along and he hasn't been encouraging of my sleuthing. Shish kebab, hummus, and baklava. I did grow up in a Mediterranean restaurant and manage it now. Jogging the Ocean Crest Boardwalk. Well, things haven't gone exactly as I've planned. To celebrate a successful summer season, the town plans a beach festival. I feel indebted to Ocean Crest and I volunteered to run the wine and food portion of the festival on the boardwalk. But things take a turn for the worse when an arrogant businessman, Archie, gets in a screaming match with my best friend, Katie, over judging a sand castle contest. And when Archie is found shot dead under the boardwalk, things don't look good for Katie. I know Katie's innocent and I won't let my friend take the fall for murder. It's up to us to investigate before another person gets skewered. Thank you for letting me chat with you today! After college, Tina worked as an NJ Deputy Attorney General, a patent attorney, and a mechanical engineer. Her law cases inspired an inquiring mind of crime, and since then, Tina has been hooked on mysteries. 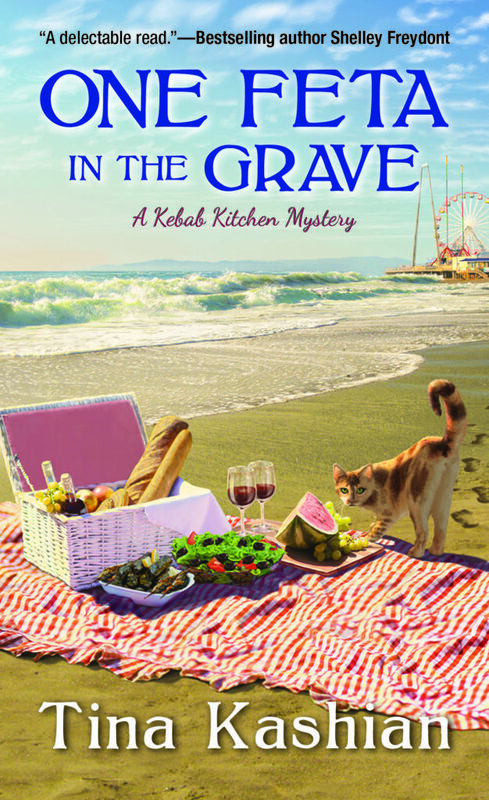 The Kebab Kitchen Cozy Mystery series launches with Hummus and Homicide, followed by Stabbed in the Baklava and One Feta in the Grave by Kensington Books. Tina still lives in New Jersey with her supportive husband and two young daughters. 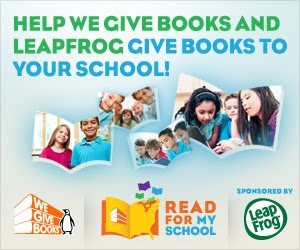 Please visit www.tinakashian.com and join her Newsletter to enter free contests to win books, get delicious recipes, and to learn when her books will be released. Good day, my book people. 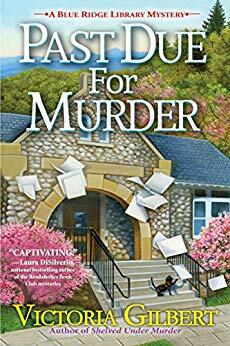 I'm always happy to welcome fellow book people to my blog and today I'm happy to announce a nice change of pace as I'm hosting a visit by the character Zelda Shoemaker from the Blue Ridge Library Mystery series, including the latest Past Due for Murder. I hope you'll enjoy hearing about Taylorsford, Virginia from the one and only Zelda Shoemaker. Thank you, Ms. Shoemaker, for enlightening us all about your town and it's residents. Hello everyone! It looks like I finally get my own guest post. It's about time, I have to say. Honestly, I'm the person who really knows what's going on in Taylorsford, but I rarely get the opportunity to share everything I know. Now my significant other, Walt Adams, would tell you that I do plenty of talking. Maybe he's right—I am a very social person. Well, I had to be, didn't I, when I was postmistress for the town for all those years? I had to know everyone, and where they lived, and who lived with them, and that sort of thing. It helped me to do my job. Now that I'm retired, I still like to keep up with the latest news. (Walt would call it "gossip," but I don't consider it as such). Taylorsford remains a fairly small town, and even though there's been a lot of growth on the outskirts over the years, I still know almost everyone. Not by name, maybe, but I do recognize who's a resident and who's not. Now, don't think I discriminate against newcomers or anything. I try to be friendly to all our new residents and visitors, which is not something everyone in town appreciates. There's a few, like that snooty Elspeth Blackstone, the current mayor's wife, who thinks that we should restrict who moves into Taylorsford, so that the "wrong sort," as she calls it, don't "bring down the tone" of the town. I say that's a lot of nonsense. Even if those Blackstones have lived here forever, I'd take a whole boatload of new folks over them. In fact, I'm currently acting as the campaign manager for a fine young lady called Sunshine Fields, who's running for mayor of Taylorsford. Honestly, I'd support anyone opposing Bob Blackstone, but I also think Sunny would make a fantastic leader. Oh, you want to know more about me? Well, all right, I'll tell you, although it's not a very exciting story. The truth is, I've lived in Taylorsford all my life. I've even had the same best friend since childhood— Lydia Litton Talbot. She and Walt and I all rode the same bus to elementary school, and have been friends ever since. Of course, since Walt was one of the few African-Americans living in the area when we were young (that's changed since then, thank goodness) he and I couldn't date when we were in our teens, even though we wanted to. I mean, you have to understand—that was back in the sixties when there was a lot of racial tension in our county high school. I guess we could've stood up to the prejudice back then, but we were both too concerned about how our families would feel, or how they might be affected by the stupid behavior of others, to fight against that taboo. So we both ended up marrying other people. It wasn't a tragedy, by any means—he loved his wife just like I loved my husband—and we always remained friends. Then, after his kids were grown (I couldn't have any, sadly) and his wife died, we started dating. Of course, I was a widow by that point. We kept our relationship secret for a while. Just out of habit, I guess. But then Sunny and her friend, Amy Webber—who's Lydia's niece, by that way—convinced us to go public. And I must say, much to our surprise, no one seems to have a problem with our relationship. Which just goes to show that sometimes the "good old days" weren't quite as rosy as some people seem to think. Today is better, in a lot of ways. Now I spend my time taking care of my house and garden, dating Walt, and spending time with Lydia and some other friends. I also volunteer at the public library where Amy works. She's the library director in Taylorsford, you know. A smart girl, and quite sweet, although she does seem to have a nose for trouble. I mean, she's always stumbling over dead bodies—can you imagine? I'm just happy she's escaped some of the dangerous situations she's gotten herself into, and found herself a good man along the way. That Richard of hers is as nice as he is good-looking, and that's a rare combination, let me tell you. Now, if we could just find Sunny someone just as fine. I mean, even Lydia is dating again, and she seems to have lucked out and hooked quite a catch later in life, just like I did with Walt. So now there's just Sunny. Poor lamb, she tends to date a lot of people but it never seems to work out. But she's such a dear, beautiful, girl I'm sure she'll meet someone special someday. Anyway, that's enough chatter from me. I don't want to prove Walt right about all that talking. I'll just wish you a great day, and remind you to tell everyone who's eligible to vote for Sunny for mayor! I really believe she'll bring some wonderful, and much-needed, change to my lovely old town. Oh, and if you hear or see anything interesting when you're visiting Taylorsford, please share! I'm always happy to hear all the latest news. 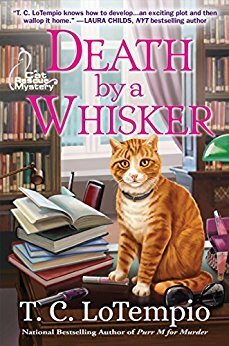 Victoria's first cozy mystery series, the Blue Ridge Library Mystery series, garnered her a three-book deal with Crooked Lane Books, which has since been expanded to five books. 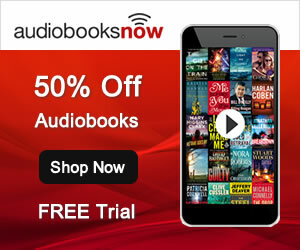 The first two books in the series have been optioned by Sony Pictures Television, and the first three were or will be produced in audiobook by Tantor Media. Spring has sprung in quaint Taylorsford, Virginia, and the mayor has revived the town's long-defunct May Day celebration to boost tourism. As part of the festivities, library director Amy Webber is helping to organize a research project and presentation by a local folklore expert. All seems well at first—but spring takes on a sudden chill when a university student inexplicably vanishes during a bonfire. The local police cast a wide net to find the missing woman, but in a shocking turn of events, Amy's swoon-worthy neighbor Richard Muir becomes a person of interest in the case. Not only is Richard the woman's dance instructor, he also doesn't have an alibi for the night the student vanished—or at least not one he'll divulge, even to Amy. When the missing student is finally discovered lost in the mountains, with no memory of recent events—and a dead body lying nearby—an already disturbing mystery takes on a sinister new hue. Blessed with her innate curiosity and a librarian's gift for research, Amy may be the only one who can learn the truth in Past Due for Murder, Victoria Gilbert's third charming Blue Ridge Library mystery. Good day, book people. 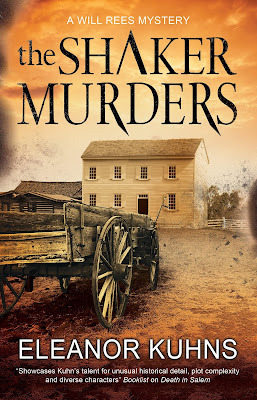 Today, I'm honored to introduce you all to Eleanor Kuhns, author of the Will Rees Mysteries including the latest addition to this historical fiction series, The Shaker Murders. Ms. Kuhns will be sharing with us insight into the much slower pace of communication in the Eighteenth Century versus the instantaneous connections we seek and crave today. Thank you, Ms. Kuhns, for stopping by and sharing this information with us today. 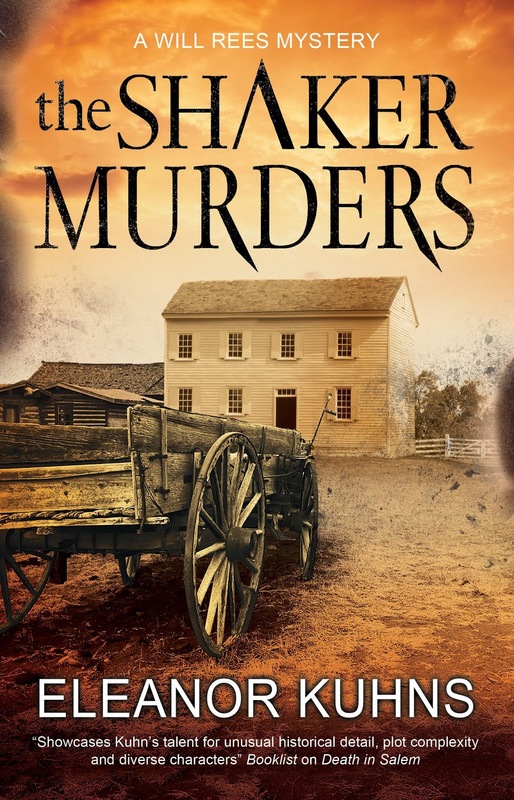 I hope you will all add The Shaker Murders to your TBR list. In this hyper-connected world where information is just a few clicks away and communication with another person, even one in another state is as close as a text, it is hard for us to imagine how isolated people were in the eighteenth century. In fact, I've had questions about this very topic, not just about The Shaker Murders but about all the books in the series. Email as a common form of communication is less than thirty years old and texting is even more recent. So, let's go old school. Telephone. Alexander Graham Bell put in a patent for the telephone in 1876. Welcome to the world of the switchboard and party line. By 1904 there were three million phones in the United States. Cell phones were proposed in 1947 but the technology did not exist then and didn't until the 1960s. It took several more decades before the cell phone (or the mobile phone) became ubiquitous. What about the telegraph? Although the telegraph was posited in 1774, the technology didn't exist at that time. It was not until the early 1800s when several scientists built varying forms of the telegraph. It came into use in the United States in 1861, (using the Morse code) and putting the end to the Pony Express. Both the telephone and the telegraph were dependent on another nineteenth-century invention: electricity. The Pony Express was a service that delivered messages, newspapers, and mail and was not an arm of the Post Office. It was instead a private business set up by three men: William Russell, Alexander Majors, and William Waddell. By utilizing a short route and using mounted riders rather than stagecoaches (which were used by the post office) they proposed to establish a fast mail service between St. Joseph, Missouri, and Sacramento, California, with letters delivered in ten days. In these days of instantaneous communication, ten days seems slow. But at that time it was considered too fast to be possible. They did succeed, however. From April 3, 1860, to October 1861, it became the West's most direct means of east-west communication before the telegraph was established (October 24, 1861), and was vital for tying California to the Eastern United States. All of these methods happened decades after Will Rees did his detecting. So, there were only two avenues of communication available to him: the Post Office or face to face. Yes, there was mail. During the Colonial period, most of the mail went back and forth between the colonies and Great Britain. It took months. In 1775 Ben Franklin was the postmaster who began setting up a postal service to take the place of the Crown Post. He set a standardized rate and set up routes from Maine to Florida. At this point, there were no post offices and mail was delivered to inns and taverns. (By 1789 there were 75 post offices in the United States.) The U.S. Constitution, ratified in 1788, gave Congress the power to set up a Postal Service. In 1789 George Washington appointed Samuel Osgood to the Postmaster's General position, which he held until 1791. So, Rees would have had to meet with every person he wishes to question. And he is limited by time of day (no electricity so he does not often drive at night) and weather. In The Shaker Murders, I avoid this problem by setting the murder where Rees and his family are living so they are on-site. But as soon as he wishes to speak to the constable of investigating elsewhere, he must take himself physically to them. He would be astonished by the variety of rapid communication methods we enjoy. 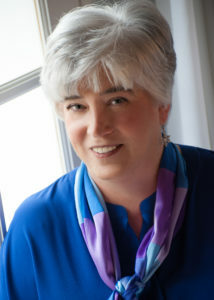 Eleanor Kuhns is the 2011 winner of the Minotaur Books/Mystery Writers of America First Crime Novel. 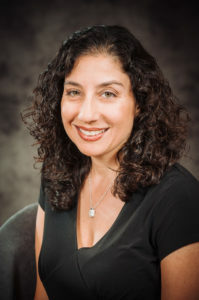 A lifelong librarian, she received her Masters from Columbia University and is currently the Assistant Director of the Goshen Public Library in Orange County New York. A peaceful Shaker community is rocked by a series of bizarre accidents, but is there more to them than first appears? Fresh from facing allegations of witchcraft and murder, traveling weaver Will Rees, his heavily pregnant wife Lydia and six adopted children take refuge in Zion, a Shaker community in rural Maine. Shortly after their arrival, screams in the night reveal a drowned body ... but is it murder or an unfortunate accident? The Shaker Elders argue it was just an accident, but Rees believes otherwise. As Will investigates further, more deaths follow and a young girl vanishes from the community. Haunted by nightmares for his family's safety, Rees must rush to uncover the truth before the dreams can become reality and more lives are lost. Yet can the Shaker Elders be trusted, or is an outsider involved? On the far side the view was nothing but ridgelines, the craggy silhouettes rising up against the night sky like the body of some dormant god. Jodi felt her breath go tight in her chest. This road went only one way, it seemed, in under the mountains until you were circled. In 1989, Jodi McCarty is seventeen years old when she's sentenced to life in prison for manslaughter. She's released eighteen years later and finds herself at a Greyhound bus stop, reeling from the shock of unexpected freedom. Not yet able to return to her lost home in the Appalachian mountains, she goes searching for someone she left behind, but on the way, she meets and falls in love with Miranda, a troubled young mother. Together, they try to make a fresh start, but is that even possible in a town that refuses to change? 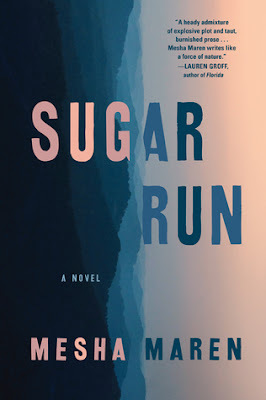 Read an excerpt from Sugar Run here. Mesha Maren's short stories and essays have appeared in Tin House, the Oxford American, Southern Culture, Hobart, Forty Stories: New Writing from Harper Perennial, and elsewhere. 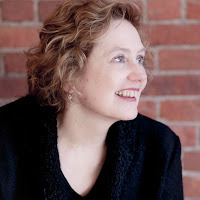 She is the recipient of the 2015 Thomas Wolfe Fiction Prize, a 2014 Elizabeth George Foundation grant, an Appalachian Writing Fellowship from Lincoln Memorial University, and fellowships from the MacDowell Colony and the Ucross Foundation. She is the 2018-2019 Kenan Visiting Writer at the University of North Carolina at Chapel Hill and also serves as a National Endowment of the Arts Writing Fellow at the Beckley Federal Correctional Institution. Getting used to life back home in Deer Park, North Carolina, Sydney McCall and her right-hand tabby, Toby, are helping her sister Kat run the local animal shelter. 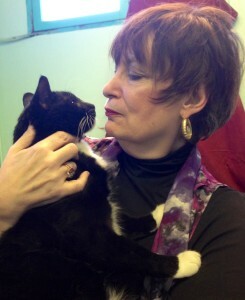 Syd and Kat are all excited about the prospect of the shelter's newest fundraiser: shopping channel queen Ulla Townsend. Shelter admin Maggie Shayne vehemently refuses to have anything to do with the woman, but the fundraiser ensues as planned. That is, until Ulla turns up dead in the middle of the event.